Some plans to update a major road in Wellington could force the village to remove some or all of about 350 iconic palm trees that have lined the road the early 1980s. 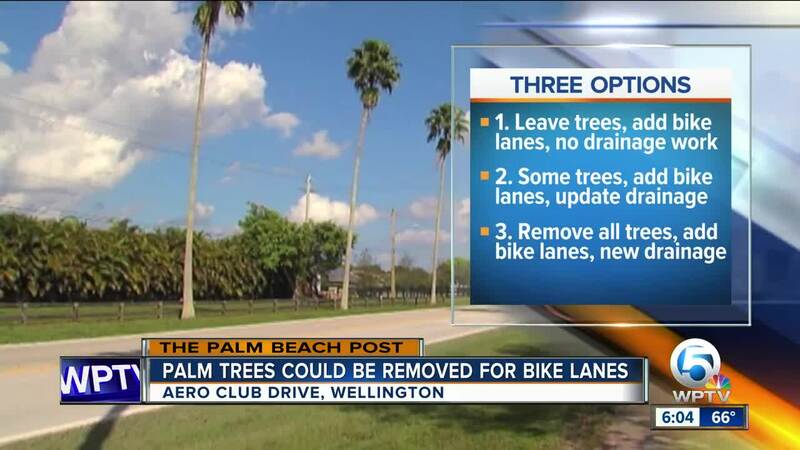 WELLINGTON, Fla. — A battle is brewing over some iconic palm trees in Wellington. A major construction project could affect hundreds of trees that have lined Aero Club Drive for decades. The Washingtonia palm trees are 40 feet tall, and about 350 of them were planted in the early 1980s. The village is hoping to improve drainage for curbs and gutters, add bike lanes and provide irrigation and landscaping to the area. However, the trees are very close to the pavement and to power lines, which would pose a problem for any construction crews. The trees were part of another planned project in 2014, when neighbors voiced their concerns involving tearing the trees down. The village has opened up a survey on its website for residents to read more about the proposed project and vote on which option they prefer. The survey only takes a few minutes to complete. Option 1 -- Add curb and gutter. Add bike lanes. No change in landscaping. No drainage or irrigation improvements. Option 2 -- Add curb and gutter, where necessary. Add bike lanes. Some existing palms remain, where feasible. Add low-lying landscaping improvements. Add drainage and irrigation improvements. Option 3 -- Add curb and gutter, where necessary. Would include landscaping cut-ins on the road for traffic calming. Add bike lanes. Replace existing palms with low-lying landscaping improvements. Add drainage and irrigation improvements. The total project cost is $2.5 million with more than $600,000 of that figure covered by grant money.